Hazon Food Conference: Take 2. The next step in the right direction. After attending the Hazon Food Conference in Asilomar, CA December of 2009, my life had changed. I became inspired, enlightened, and awe-struck by the amazing New Jewish Food Movement. After last year’s conference, I packed up my bags in Denver, CO., closed my meat business, (the Denver Kosher Shuk), and drove out to Los Angeles, the city I pictured with a large, vibrant, colorful Jewish Community, and a more health conscious environment. I am beyond happy to say, I have found everything I was searching for. Most people like to look at Rosh Hashanah, or New Years as their reference of time, and while I love using Rosh Hashanah as a time for reflection and decision making, I enjoy using Hazon as my marker for direction. For a multitude of reasons, which I will explain further, Hazon has inspired me to dream big, have faith, and believe. Prior to attending my first Hazon Food Conference, my life had taken a turn. I learned I had alopecia, (an auto-immune disease that causes one’s body to have an allergic reaction to their hair follicles, causing the hair to fall out), and was faced with two options: let the Dr’s. take a shot at “curing” me, or letting my new found belief in the power of food, do the trick. I chose food, started a kosher meat business, providing the best, highest quality kosher beef to the Denver Jewish Community, and began eating a primarily raw-vegan diet. Amazingly, my hair began to grow back. Now, I can’t say I have any true power myself, because I believe Hashem has that control, but I do believe I can work hard enough to have the power to control the food that enters my mouth, the thoughts entering my mind, and the community in which I live. I decided to take a break from the meat business, and move out to LA, where I would find a shul I felt spiritually connected to, and a job being a raw-vegan chef. (I had cut back on the amount of meat I ate, usually eating meat only on Shabbat, happy days and yom tovim – the Mooshy paradigm I was introduced to at Hazon 2009. I then turned this paradigm into my own “OOSHY” lifestyle, and I now live the “SOOSHY” life, because soul food is my weak-link. (Soul food for me being closely tied with a typical “Jewish Meal.” Challah, matzoh ball soup, and my mom’s brisket and chocolate chip cookies. :). 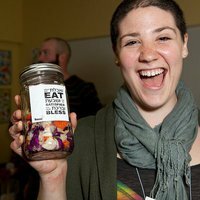 After landing in LA in January of 2010, I found a shul I fell in love with, IKAR (ikar-la.org) and a job working at an awesome vegan restaurant (Real Food Daily). I stayed with that restaurant for 6 months, worked for the amazing Raw-Vegan Restaurant 118 Degrees for the next 3 months, (118Degrees.com), and was then blessed with the opportunity to work at the Whole Foods in Venice, CA, helping them develop a raw-vegan prepared foods section. Additionally, I am a current resident of the Los Angeles Moishe House (moisehouse.org), an amazing Jewish organization on a mission to develop a Jewish Community for Jews between the ages of 22-30. (Shout out to the Moishe House for helping me attend the Hazon Conference this year! Thank you from the bottom of my heart). I am living the dream, and this dream was inspired at Hazon 2009. So now, having just returned from Hazon 2010, where will my life take me? For this year, I see a beautiful marriage between my passion for raw-vegan food and my desire to provide the most eco-friendly, high-quality anti-biotic/hormone free, kosher beef., by working on a new business developing both raw-vegan, and beef products. I want to help inspire the world to live their own OOSHY lifestyle, and G-d willing I will be able to provide the raw materials to make that journey, easier for you. I see a beautiful garden at the Moishe House and I see a movement of individuals who are going to become even more conscious of the food they eat! I intend on holding raw cooking classes, and discussions on health, wellness and Judaism! My company, Raw-9, (raw-9.com), is in its initial stages, but through this upcoming year, I see beautiful potential. Hippocrates once stated, “Let your food be your medicine, and your medicine be your food.” I say we listen to that wise man. Thank you Hazon. I look forward to growing with you this coming year! Thank you also, to the Rose Community Foundation of Colorado for helping me attend Hazon 2009! Julie you make me smile! It is so great to hear that you are so happy and you have found something you are so passionate about. You are so inspirational – always happy, always optimistic, and always looking on the bright side of life! I admire you! I’m so happy for you, and you have my full support for Raw-9 and all you do! I just read your post on the Hazon newsletter – I could not find a contact email on your site. But I am interested in the eco-friendly beef, many of us in LA are trying to figure this out and was wondering if you are getting leads etc… We were even thinking of trying to arrange a cow-share with a local farmer and finding a shochet etc.. to figure it out. I would love to hear more – please contact me! Look forward to meeting you soon – I will look for you next time I am at the Venice Whole Foods. I’m assuming you’ve discovered Rawsome around the corner? Thank you for your comment! Right now I do not have specifics about the eco-friendly beef I mentioned, however, it is in the works. Once I have more information, I will let you know! Rawsome is awesome, they’re dried mangos are my favorite :).